Minimizing the amount of vibration your machines experience is critical to their long-term performance. Enhancing the longevity of critical machinery with high-performance vibration isolation. Minimizing the amount of vibration your machines experience is critical to their long-term performance. Vibration fatigue can cause premature equipment failure and expensive machine downtime. But finding a way to reliably and cost-effectively counteract it has always been a challenge. Enter ITT Enidine Wire Rope Isolators. 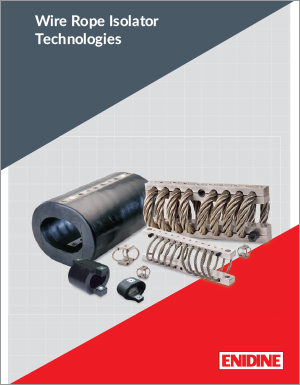 Engineered with a rugged, all-metal design comprised of stainless steel cable and aluminum retaining bars, our wire rope isolators provide unsurpassed multi-axis vibration isolation. They require almost no maintenance. They’re environmentally stable and — since our customers depend on us to help their machines perform in even the harshest environments — they’re highly resistant to extreme temperatures, oil, ozone, abrasives and chemicals. Our wire rope isolators also come complete with a patented crimping pattern. Along with our array of versatile mounting options and sizes, this design makes our products ideal for a broad range of applications in the Commercial, Industrial and Defense industries. All of our wire rope isolators meet the industry standards of DEF-STND 0755, MIL-STD-810, BV43-44, MIL-STD-167, STANAG-042, MIL-S-901 and MIL-E-5400. The best part? Even if your application parameters fall outside our standard product line, ITT Enidine has the engineering capabilities to design, test and recommend a custom solution to suit your specific needs. For more than 50 years, we’ve partnered with our customers to provide value that extends beyond our products — leveraging our extensive knowledge to address your most challenging applications. Want to learn what we can do for you? Let’s talk. Let us solve your most challenging noise and vibration problems.